Out hiking in the backcountry? Managing a lodge in the wilderness? Out of cell phone range? One of the best ways to keep in constant contact with friends or employees is a two-way radio system. Two-way radios work best in rural settings where there isn’t a lot of interference. They have an incredible range; with just the sets are good upe push of a button, you can communicate with someone who is miles away. If you’re shopping for two-way radios, you’ve come to the right place. On our site, we’ll introduce you to two-way radio basics and help you to compare popular brands and top-selling models. We’ll also be giving you tips in our blog for using your purchase! Below, you can view a comparison chart for current top models of two-way radios. Scroll down below to discover the basics of these handy devices, including types, range, channels, and more! If you are looking for more detailed information on the handheld two-way radio models above, please read our reviews. Before you do, though, we suggest reading on to learn more about two-way radios. That way you will know what features are important to you and will be able to make an informed purchase decision. Two-way radios are also known as walkie talkies. They are small handheld devices which transmit and receive radio signals for short-range communication. This allows you to stay in touch with family, friends, employees, or co-workers even in remote locations with no cell phone signal. Two-way radios may also include additional handy features such as NOAA weather alerts. These alerts can help you to stay safe while you are out in the wilderness. Two-way radios send and receive information through radio signals, which means they rely largely on line-of-sight for strong communications. While they can to some extent transmit through walls and other obstacles, they work best in a wide open unobstructed area. This is why their range is limited, especially in urban and suburban areas as well as densely-wooded regions. These high-power models operate on 1-2 watts and can use up to 22 channels. You need a license to use these. Originally GMRS was only available for commercial use, but you can now buy recreational GMRS radios. You do not need a license to simply purchase a GMRS radio set. These models operate on a half-watt and can transmit on a total of 14 channels (though 22 channels are available). You do not need a license to use these, which is why most consumer models are FRS radios. Your standard walkie talkie devices. These mount on your vehicle, just as you would expect, and are able to take their power from your vehicle’s battery. You can augment their range with an external antenna. These can draw energy from your wall and function on AC power. Once again, you usually need external antenna to boost the range. So those are the basics—now let’s talk about the range of a two-way radio set. Then we’ll talk about how that relates to power and antennas. We will then talk about channels and codes, compatibility, features, and batteries. We’ll wrap up by discussing cost. Range can vary quite a bit on handheld radios. Some sets are good up to 8 miles, while others may be good up to 20. Be very wary of that “up to” language that you see on packaging. These are best-case scenario claims. If you are standing on a flat plain right across from someone, you might actually get the full range. Otherwise, with trees or buildings in the way, disrupting the signal, you will probably get a fraction of that range. Here’s the bottom line: No matter what range you see on a package, you generally will only get reception for up to 2 miles. And if you are planning on using your radios in an urban area, good luck—you will have a very tough time getting good reception. Open wilderness conditions are best, preferably with flat terrain like plains, a desert, or a valley. Believe it or not, even your own body can block your signal. One thing that is helpful to know about power is that it can boost your range! The higher the wattage, the better the range of your radios. For that reason, if it is very important for you to have a high range, it may be worth it for you to get a license to operate on GMRS channels. Note that if you have GMRS radio, when you transmit on the FRS channels, you will automatically drop to a half-watt while you are operating on those channels. The higher wattage on the GMRS channels are exactly why you need a license to operate on those channels. You get a much stronger signal as a result. FRS channels will be sufficient for many purposes. Say for example that you manage a ski lodge and are distributing radios to your employees. Since they will be operating them mostly within a small square radius, there will generally be no problem using the FRS channels. The antenna is also important when you are considering range. The rule of thumb here is pretty simple: the bigger the antenna, the better. Larger antennas will have a higher “effective radiated power,” which may extend your range. The only reason to go with a small antenna is if you have to in order to conveniently carry or stow the device. Otherwise, look for a model where the length of the antenna is the same as the length of the actual radio or close to it. And remember, if you are using a base station or vehicle-mounted unit, you will get much better transmission and reception if you add an external antenna. This isn’t really an option with handheld models. Why not? Some models may give you the option of replacing the antenna with a different one, but if the new antenna isn’t properly tuned to the radio, your range may actually wind up being lower instead of higher. No matter which type of radio you get, it will probably come with 22 channels, each with up to 121 “privacy” codes. These reduce interference on the same channel. The FRS band was created back in 1996. If you are an FRS radio user, you can use the 7 FRS channels as well as 7 channels that are shared with GMRS users, for a total of 14 channels. GMRS users can use these 14 channels plus the 8 channels designed exclusively for GMRS use. If you are in a busy area where a lot of people are using two-way radios, you may hear interference on all of the channels. This is very common in resorts and on park grounds. For this reason, radios come equipped with privacy codes called CTCSS or CDCSS (Continuous Tone-Coded Squelch System or Continuous Digital Coded Squelch System, respectively). These allow you to use the same channels as other users, but speak privately without interference. So four users could all use Channel 4, for example, but the first two could use Code 2 and the second two could use Code 3. The conversations will not be completely private; you may still occasionally pick up chatter from other code channels, but it will be greatly reduced. Snatches of your conversation may also be overheard by other users. And don’t forget—any user can call up your channel and code and listen to your entire conversation! Note if you and another user try to simultaneously transmit on one channel, nothing will be transmitted. There are of course situations where you want everyone to be able to hear each other on one channel, and not just two people. If you are purchasing these radios for your ski resort staff, for example, each department will probably use one channel, and you may also have a channel for lodge-wide communications. You want your entire team to be able to communicate, and the fewer channels you make use of, the better, since that way everyone will be tuned to the right one. What about compatibility? Radios with the same set of features will be able to transmit to one another with ease. So all modern radios should be compatible. If you have an older radio, it may not be able to send out the same tones as your newer models. If this is the case, try setting your new model to code 0 on channel 1. By default, it is probably set to code 1, which your old model cannot necessarily pick up or transmit on. Now let’s talk about how you will keep your radios running. The majority of two-way radios function on AA and AAA batteries, usually your regular alkaline variety. Others include rechargeable battery packs (NiMH or NiCad). The most flexible option is to purchase a radio that can use both. Why? Rechargeable batteries are excellent for saving you money, but they tend to lose their charge quickly. This is particularly true in cold environments, so for skiers and hikers in cold climates, regular batteries may offer superior performance. If you get a model which is compatible with both types of batteries, you can use your rechargeable batteries, but switch to regular alkaline batteries as a backup if you need to. You may also find a model which includes a solar charger that you can use while you are out in the wild. We also recommend that you look for a battery-saver mode as an extra feature; this will drop your radio into a low-power mode when you are not using it. IPX1: Protection from vertical drops. IPX2: Protection from vertical drops and drops at an angle of 15 degrees. IPX3: Protection from spray up to 60 degrees. IPX4: Protection from splashes in any direction. IPX5: Protection from water jets from any direction. IPX6: Protection from powerful jets. IPX7: ACTUAL WATERPROOFING in up to three feet of water. IPX8: ACTUAL WATERPROOFING in more than three feet of water. VOX is also known as “Voice Activated Transmit.” With this feature, you can use the radio hands-free. When you speak, the radio will pick up on it and start transmitting automatically. These are excellent for everyone, but particularly makes a great choice for workers or for people doing sports. If your radio is marked with either of these, it has been designed to meet military specifications. This means that it meets a certain threshold for reliability, durability, and compatibility, and that it will stand up to exposure to different environmental factors. If you will be skiing or hiking in harsh environments, the military rating is a good one to look for. This stands for “Ingress Protection.” It is a rating that tells you how effectively your radio is sealed against dust and moisture. If you know you will be using your radios regularly in conditions with a great deal of dust or precipitation, you may want to pay close attention to the IP rating of the model you are thinking of purchasing. This feature will help to clarify and boost your signal. You can use this to lock your settings. That way you will not lose them while you are doing your activities. Self-explanatory. You can use this to hook up a headset for hands-free operation. This is great for sports. If you want to stay on top of the latest weather reports, this feature lets you check the NOAA weather band stations to see what conditions you can expect. If you are exploring the backcountry, this is a must. Some radios actually offer GPS, so you can use them not only to communicate, but to find your way around as well. Better yet, you can use them to transmit your location to other users and check where they are. If you are out hiking or skiing with friends, this is a great way to keep track of each other, and an excellent safety feature. If someone gets too far ahead, falls behind, or takes a wrong turn, you will be able to locate them. Two-way radios range widely in price. You will find cheap walkie talkies as low as $20 and high-tech units which cost more than $200. A typical price range for a pair of handheld radios is around $20-$80. You can get a pretty solid set which will offer you some nice features in the $50 range. The more you have to spend, the better you will get in terms of durability, reliability, power, and range. If you have been looking for a set of two-way radios which you can use in even the most severe weather conditions, you may want to think about the Motorola MT350R. These radios were built to withstand the elements, while offering you the range you need for outdoor use in a variety of environments. 22 channels with hundred and 121 privacy codes. No matter where you are located, you should have no problem finding a private channel to speak on. Up to 35 miles of range. That is under ideal conditions with no obstructions. While you will not get nearly that range in real conditions, these radios can easily compete with others on the market. You should be able to get around 2 miles in a suburban setting, which is actually pretty good. Weatherproofing. This set of radios meets IP54 standards for weatherproofing. That means that they are designed to continue to operate in dusty conditions, rain or snow. While they are not waterproof, they can withstand splashes of water. Weather alerts. Find out if inclement conditions are on the way with NOAA weather channels. Other excellent features. Other features which enhance the Motorola MT350R include a high efficiency class D amplifier for clear, loud sound quality, VibraCall™ silent signals, and eco-friendly design. Everything you need. 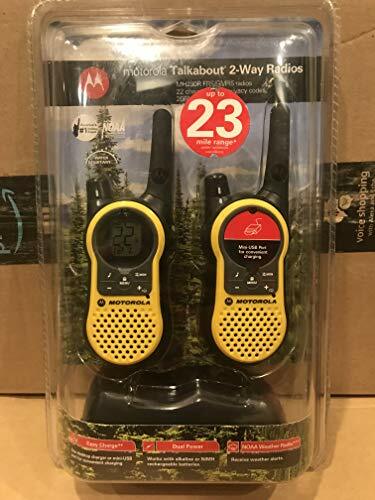 Your purchase of the Motorola MT350R includes both the radios in this set, two rechargeable battery packs, two belt clips, a wall adapter, a user guide, and accessories sheet, and an emergency preparedness checklist sheet. Sometimes these radios arrive DOA. This seems to be the result of a manufacturing flaw which affects some of the units. Thankfully, it is not that common. If you don’t want to risk damaging your smartphone on a camping trip but you still want to communicate, it makes sense to invest in a two-way radio. The MH230R from Motorola doesn’t cost much, but it is tough enough to survive any type of outdoor adventure. Very popular online. The MH230R is an online bestseller mainly because it works well, looks nice and doesn’t break easily. Performs well in difficult terrain. Some two-way radios struggle in challenging environments, but with the MH230R you can communicate up to 3 miles away pretty much anywhere. Good battery life. The battery will last all day no matter how much you use the MH230R to talk. Great value. Even though this walkie talkie is cheap, it performs quite well, it costs much less than the competition. Weather alerts. NOAA weather alerts clue you in when foul weather is on the horizon. Rubber coated shell. The MH230R is tough enough to take more than just a few dings. Compact size. Just slip this walkie talkie into your pocket and take it with you wherever you want to go. The MH230R’s buttons are hard to push, but that’s probably because they are designed to keep water out. This walkie talkie is water resistant, but it will take damage if you leave it floating in water for more than a few seconds. 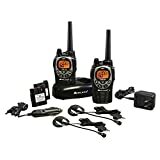 One of the most popular walkie talkie brands is Midland, especially in the lower price range. 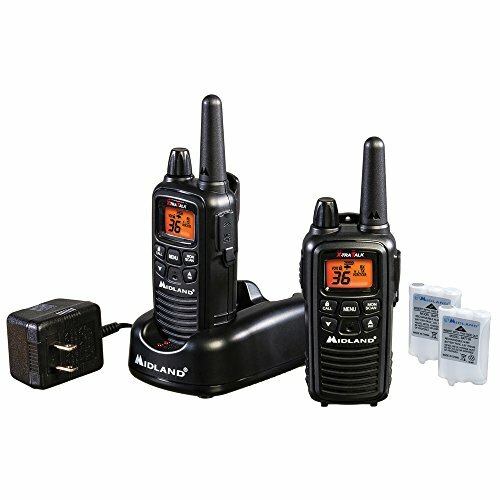 One set of Midland walkie talkies to think about is the LXT600VP3 model. While the range is slightly lower for these walkie talkies than it is for some of the others in this list, it should be sufficient for most purposes. 36 channels. Even in most busy settings, this should be more than enough, particularly given that you also have 121 privacy codes. That equates to 2,662 channels in all. 26 mile range. Unless you really need to maximize your range, this should be fine for many situations. The right price. These walkie talkies tend to be less expensive than many others. 3 levels of Vox. Choose exactly how you want to operate your walkie talkie. Weather scan. With this feature, the radio searches for the closest NOAA broadcast. That way you always get alerts which are relevant to your location. Additionally, the radio includes All Hazards Alert. That means that other types of emergency alerts will reach you as well (i.e. fire or landslide warnings). Dual Power. You have the option of using rechargeable or standard AAA batteries. Compatible with a range of Midland headsets. Models include AVP-1 AVPH1, AVPH2, AVPH3, AVPH4, and AVPH5. Some units may have a defect. Some LXT600VP3 seem to have a defect which causes them to fail within a couple months of use. This does not appear to affect too many radios, but it is something to be aware of before ordering. The Motorola Talkabout™ T400 two-way radio set was designed with simplicity, ease of use and convenience in mind. As such, these radios are perfect for everyday use in any setting. Use them to keep in touch with family or friends in the neighborhood, or take them with you on vacation. Their versatility makes them adaptable to a range of purposes. Weatherproofing. These radios have earned the IP54 weatherproof rating. This means that they can keep out dust and rain, and even some splashes of water. Privacy wherever you go. There are 22 channels and 121 privacy codes, for a total of 2,662 different combinations. Universal compatibility. 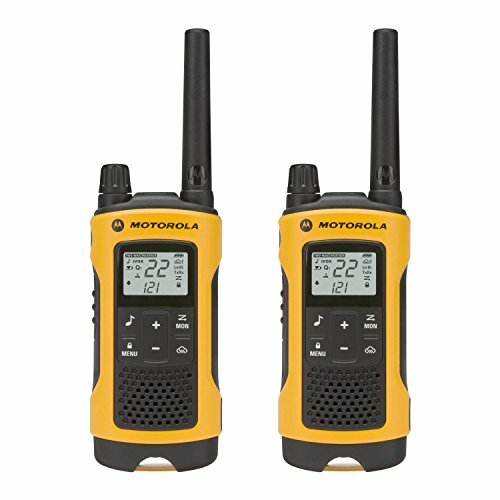 These radios not only can talk to other Motorola radios, but can also be used to talk to any other FRS/GMRS radios. Built-in LED light. This is a great feature for outdoor use, may also come in handy if your power should go out. Eco-friendly design. While idling, these radios are designed to only run on half a watt. This helps to prolong battery life. When your batteries do run low, the indicator will tell you so. An array of other great features. These include hands-free operation, call tones which you can customize, keypad locking to keep your settings in place, and more. Sound quality is not top of the line. Then again, these are not premium two-way radios. For the price, the sound quality should be adequate for most users. I’m no expert in 2-way radio’s and this was an extremely helpful overview of the different terms used in walkies-talkie land… Thank you very much for putting in the time.. I found this information to have a great deal of value to me. I now am a better informed consumer in search of the right two-way radio for my needs. Thank you!